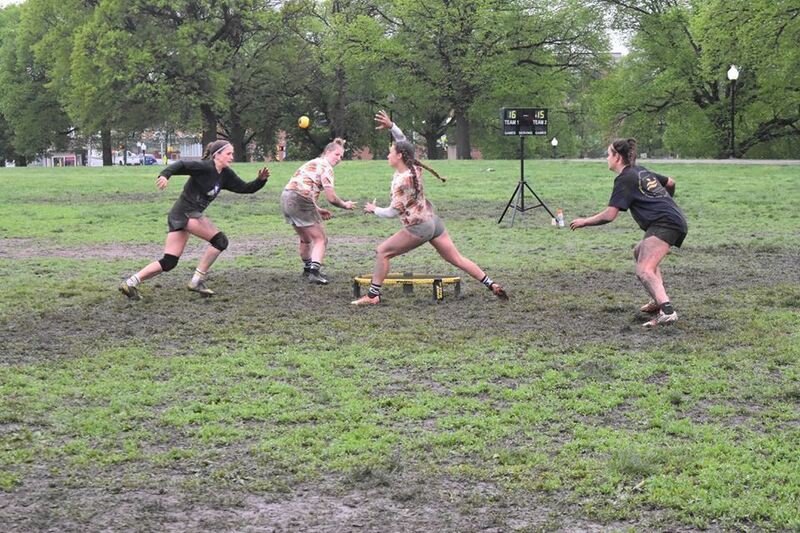 This past year, the fourth year with official Spikeball™ Roundnet Association events was a great year for roundnet. Here is a list of what I think were the best moments of 2017. Okay, some are longer than a moment, but bear with me. Although Bolivia has been a well-known roundnet team since mid-2015, before this season David and Gustavo Gonzales had never found themselves in the top 10 of the Power Rankings. In 2016 they teetered between the high teens and early 20s and lodged themselves around #13 for the first fourth months of 2017. Out of nowhere, Bolivia had an explosive May and early June. After being predicted fourth in the Charlotte Tour Stop prediction poll, the then ranked #12 Bolivia took out #11 Anchored LI (Ryan Fitzgerald and Anthony Alvino), The Rally Bloggers (Anthony Rentsch and Mike White), and #8 Golden Set (Harding Brumby and Eric Zishka) to take the tournament. This was a huge milestone both for David and Gustavo, but also for the Southeast Region as a whole, as it was the first time a pure-Southeast team won an official SRA event. Their win ignited a discussion about whether this one performance was a fluke. But, they showed off their skills again a week later at the Philadelphia Tour Stop where they placed second to #1 Cisek/Showalter (Tyler Cisek and Peter Jon Showalter) after defeating #9 Ohio Against the World (Vinny Bonta and Jesse Showalter), #16 Do a Barrel Roll (Ben and Ezra Dantowitz), and again #8 Golden Set. This propelled Bolivia to the #5 spot in the Power Rankings. To finish their explosive run, Bolivia placed third at the Nashville Grand Slam, losing a three-game series to #4 Origin Impact (Patrick Drucker and Chris Hornacek). They defeated familiar foes Golden Set and Ohio Against the World (then ranked #7 and #14, respectively) en route to the podium. Bolivia didn't find as much success later down the stretch but this three week span of phenomenal play will go down in the record books. The Baltimore Tour Stop in April brought us the first 2017 Women's Division appearance for 2016 National champions Ogres Heroes (Becca Graham and Alli Kauffman). Also in attendance was surprise Nationals 3rd place finishers veinte hamburguesas (Tori Farlow and Charissa Wright). At this point, Ogres Heroes had not lost a set (or tournament) to another women's team since June of 2016. The beginning of the tournament went as expected with Ogres Heroes and veinte hambruguesas earning the #1 and #2 seeds, projected to meet in the winner finals. When we reached the winner finals, Ogres Heroes took it in two games. However, on this muddy day in Baltimore, Wright and Farlow of veinte hamburguesas fought hard in the first set of grand finals and won in three games. Although Ogres Heroes went on to win the next set and the tournament, this win by veinte hamburguesas was huge. Witmer and Kauffman were not invincible, which made future women's tournaments just a bit more intense. Ogres Heroes and veinte hamburguesas in the Baltimore grand finals. Roundnet is growing everywhere. After seeing tons of roundnet being played in the Montreal area (mostly thanks to ambassador Charles Henri) an official "bonus" tour stop was announced for the season. Henri added this tournament to his 7-stop Quebec Tour Series that spanned the summer and fall. Five American teams made their way up north to meet with the 60+ Candaian teams. Golden Set took home first place in the Advanced Divison and three Canadian teams and one American teams were able to earn Premier status. This tournament also featured the largest Women's Division of 2017 to date! Montreal is returning as a bonus tour stop on July 14, 2018. After years of inconsistent and isolated roundnet statistics activity, Max Model of Hilltop Spikes led the first big development. Model created and refined an algorithm to rate a player's performance in a game of roundnet (aptly named the "Roundnet Player Rating"). The rating takes game statistics like hitting percentage, serving percentage, defensive touches, and other details to calculate a score for four categories: Hitting, Serving, Defense, and Cleanliness. For the first time, we had a measure of how well players performed in a match. Check out the RPR Analysis of the Boston Grand Slam semifinals here. Although many college-aged individuals and college students play roundnet, there has not always been a competitive collegiate roundnet scene or organization. In early 2016, Logan Cornelius created the National Collegiate Roundnet League (NCRL), a head-to-head league between schools in Texas. The NCRL featured regular season matches and a championship game. Later that year, Cornelius lead the college roundnet scene again, this time helping organize college tournaments all around the country. In April of 2017, teams representing 14 schools came together for the first ever Collegiate Spikeball™ Roundnet Nationals, at Clemson, SC. This tournament was just the beginning for college roundnet, which will now feature Sectional Championships in addition to the National Championship. Read more on Collegiate roundnet here. 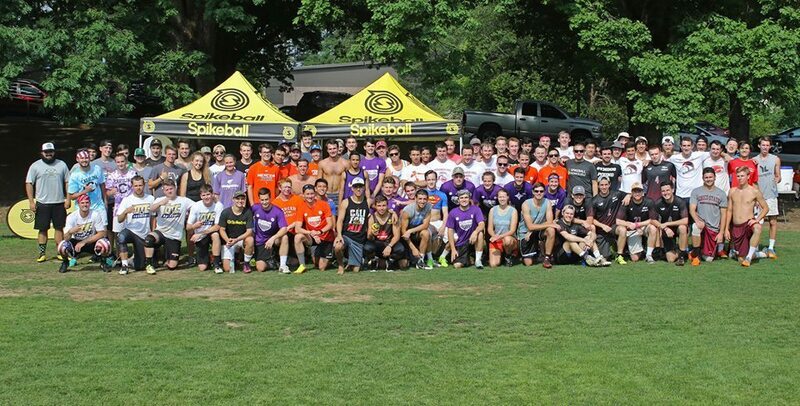 A group photo from 2017 Collegiate Spikeball™ Roundnet Nationals, at Clemson, SC. Throwback to the summer of 2015, when Chico Spikes (Skyler Boles and Shaun Boyer) had won all six tournament they entered in 2015 and only had one recorded loss in history. Spikeball Inc. put a bounty on their heads, offering $2500 to any team that knocked this dominant team out of their next five tournaments. Unexpectedly, a mash-up team of Tyler Cisek and Peter Jon Showalter was able to take out Chico Spikes in the finals at SummerSpike in Coney Island, NY. This is now considered the biggest roundnet upset of all-time. Two years later we found ourselves in a very similar situation. By mid-summer, Cisek/Showalter had won all six events they attended in 2017. A bounty was set once again, with $500 going to any team who could beat them at the Boston Grand Slam. If Cisek/Showalter was to win this tournament they would be awarded $2000 for their sweep of the East Tour, so a lot was on the line for both sides. In the semifinals, the bounty curse struck again. Anchored LI stunned Cisek/Showalter, eliminating them in a three-game series. Cisek/Showalter had lost games before, but this was the first (and final) set they would lose all season. This upset was a little extra sweet as Fitzgerald and Cisek previously played together as The Rookies. Anchored LI kept it rolling and took out Origin Impact in the finals, making it one of the most exciting days in roundnet history. Back in August, the roundnet community enjoyed a night of fame. On August 29, a rally from the Long Island King of the Island was posted to the SRA Twitter page with the hashtag #SCTop10. This caught the attention of someone at ESPN, who sent a DM asking for permission to use the clip. About an hour later, Andrew Card of Easily Dug posted this image into the SRA Facebook community with the caption "Am I dreaming?". The rest of the night was spent in awe looking at the steadily rising number of views that the rally received on SportsCenter and the Bleacher Report's Instagram and Twitter accounts. The SportsCenter Instagram post hit 1.6 million views not 24 hours after release. 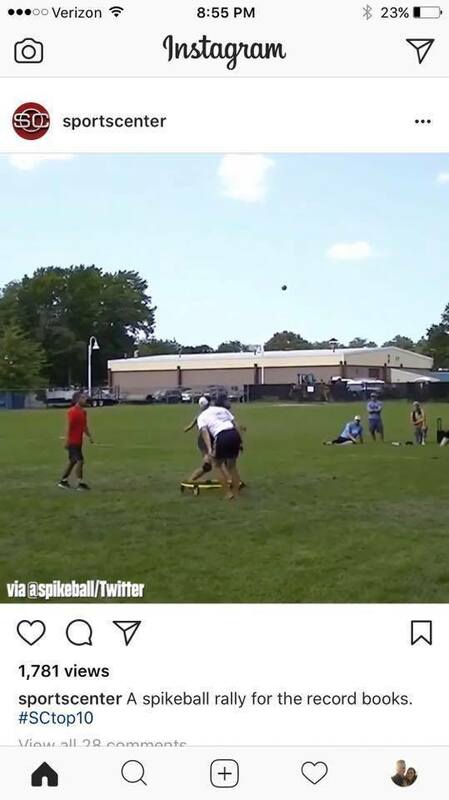 This also brought a lot of traffic to the Spikeball™ Instagram page and help it gain 10,000 followers. The icing on the cake was tuning into SportsCenter later that night and seeing the rally featured on the Top 10 plays. Check out that TV clip here. Of course, brackets at Nationals will always be unpredictable, but few expected then ranked #8 Spicy Rubi (Anthony Renstch and Daniel McPartland) to make it to the finals. With some solid play and bracket luck, though, Rentsch and McPartland landed a spot in the finals. On the other side of the bracket, #1 Cisek/Showalter solidly defeated Strange Embrace (Devin Matson and Jarratt Rouse) and 2 Guys (Troy Mauk and Preston Bies) and was looking poised to take the championship. Everyone in the arena (and hundreds online) gathered to watch this match. It was a tight battle all the way through game one and headed into extra points. At 21-21 Spicy Rubi took the advanage with a drop ace by McPartland on Cisek. A few points later, McPartland aced Showalter to give Rubi a 25-23 game one win, electrifying a crowd that remembered 2 Guys upsetting Chico Spikes in the 2016 National finals. Although Cisek/Showalter did move onto take the series and championship, the excitement this game one win generated and the intensity it brought to the later games of the series makes it one of the best moments of the year. I think most agree that Nationals 2017 was not your typical sporting event. To start off the day off, a heavy thunderstorm prompted the cancellation of the tournament at 6 a.m. At this point, the search for new locations began. After some discussions and phone calls, two indoor facilities were locked down and the tournaments were back on. When the players, staff, and spectators arrived at these new locations, the community came together to help set up the event. With the help of many, the Nationals 2017 ran smoothly and was an event to remember. After facing the potential worst roundnet moment - Nationals being canceled - the spirit of the sport's community showed up in a big way, as a lot of different people came together to save the tournament. And last but certainly not least, Cisek/Showalter and Ogres Heroes winning their respective National championships has to be the best roundnet moment of the year. As mentioned above, these two teams had remarkable seasons and were the two most deserving teams of the national champion title. Such dominance brings a lot of excitement to their matches as fans are eager for upsets, which is only heightened at Nationals. Both Ogres Heroes and Cisek/Showaler had to fight through a pack of top teams and players to solidify their #1 spot and finish out near perfect seasons. Cisek/Showalter and Ogres Heroes pose with their trophies after 2017 Nationals. What was your favorite moment of 2017? What great things do you predict for roundnet in 2018? Let us know! Got something related to roundnet that you want to know more about? Have any topics you want to be discussed on the podcast? Contact Mike White at mwhitey17@gmail.com or @mwhitey17 on Twitter. 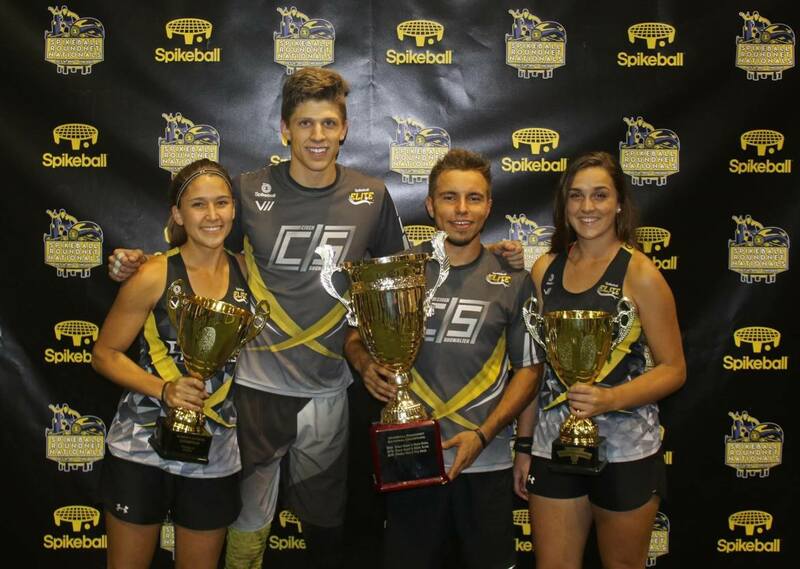 Follow the Spikeball™ Roundnet Association on Twitter and Instagram!